the music of Turlough O'Carolan (1670-1738), Irish harper and composer. All 226 airs are included on 4 CDs played by Irish harper Caitri­ona Rowsome. New info. for Songs: Carolan's surviving lyrics for the airs. Many of the airs are not commonly known as songs, and some include lyrics published here for the first time. For each of Carolan's Irish songs, an English interpretation is also provided. The O'Carolan Heritage Park, in the centre of Keadue village, was opened in 1993. 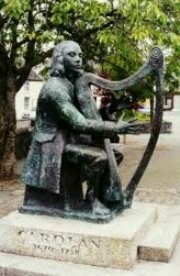 At the opening ceremony a specially commissioned work by sculptor Fred Conlon modelled on Turlough O'Carolan's Harp, was unveiled in memory of O'Carolan. Turlough O'Carolan was reared in Kilronan and spent his years as a harper and composer travelling around the area and adjoining counties. The Park also features a reconstructed Sweat House, the ruins of which were found on the original site when work commenced on the Park. These houses were the fore-runners of the modern sauna. A new recording of O'Carolan songs, with lyrics adapted from the original Irish Gaelic and presented in English song form. Patrick Ball, Celtic Harper - O'Carolan's Farewell to Music, conceived and performed by Patrick Ball, and written by Patrick Ball and Peter Glazer, is a one-person musical theater piece which brings to the stage the legendary life,the turbulent times and the captivating music of this most celebrated Irish artist. Interspersed with performances of fourteen of Carolan's tunes played on the rare wire-strung harp, the play tells the harper's story through the character of poet and harper, Charles MacCabe, Carolan's life-long friend and traveling companion. Through MacCabe's eyes and Carolan's music, we are drawn into this storm-tossed chapter of Irish history. The play, enriched by Carolan's beautiful melodies and the crystalline sound of Patrick's harp, is charged with Irish wit and pathos, and demonstrates both the power of friendship and the vital role of the artist in troubled times. A delightful article about Carolan - where he lived and died, his grave-site, etc. Wonderful photographs included. Turlough by Brian Keenan An excerpt from BBC World Service: Brian Keenan: Prisoner Turned Writer "In a moving interview, Keenan speaks to Outlook about his relationship with Turlough - the companion he imagined; the harpist who helped keep him mentally and emotionally stable through prolonged times of solitude, pain and deprivation." Check out these interesting tid-bits! Click to "Like" the Turlough Carolan Facebook Page!